There are no complaints from this girl with the lack of snow we've had this winter, in fact our winter has been very mild. Makes me wonder what the Ides of March will bring. What better way to finish off the last week of February with some snowflake dishes. Embossed like edges full of fun and whimsy look like small peaks of snow. For Christmas my daughter gave me these darling dishes, does she know my heart or what? I immediately set up a table of the last remaining bits of Christmas that were hanging around. Oh my goodness NO; it's all been put away for a very long time. I just hadn't gotten around to putting the pictures together to share with all of you. A treasured mug awaits your drink of choice. Using mixed sets of dishes only adds to the excitement of a tablescape. The beauty of red and white is always a sure winner. White antique edge dishes came from Walmart a few years ago. A red and white snowflake napkin coordinates with the snowflake napkin ring, adding the second snowman napkin only adds to the fun table. The candy canes were put away ages ago, the Hershey kisses and M&M's were finally finished up on Monday, just in time for Jellybeans to fill the apothecary jar. This is such a fun table, perfect for a winter day! Your snowflake dishes and napkins are so cute. I love the candy canes! It definitely feels like spring is around the corner...we have had a really mild winter, too. As you say, who knows what March will bring! Once a farmer, always a farmer...J is worried about the lack of moisture this winter. A friend was digging the other day. He said the earth was dry several feet down. Of course, I certainly appreciated the lack of much snow when J was in hospital. Had a little bit and it melted quickly. But then I think about gardens and crop fields this year and wonder how things will do. Someone we know hauled hay out to OK last week. He said the pasture is just about gone out there. Love the white dishes!! Such a fun last winter tablescape! 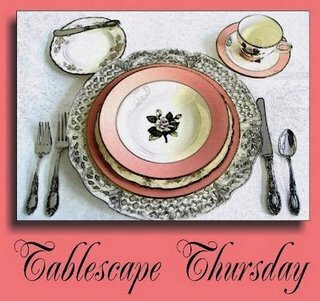 Come link up to centerpiece Wednesday on my blog. Lovely! And I admire that you had this last Winter tablescape in you...I DO NOT! I am just plain flagging all over the place, Lynne.